Living in a city can be expensive, and Stockholm, Sweden, is no exception. Sometimes you have to think creatively to imagine what can be achieved in a space. 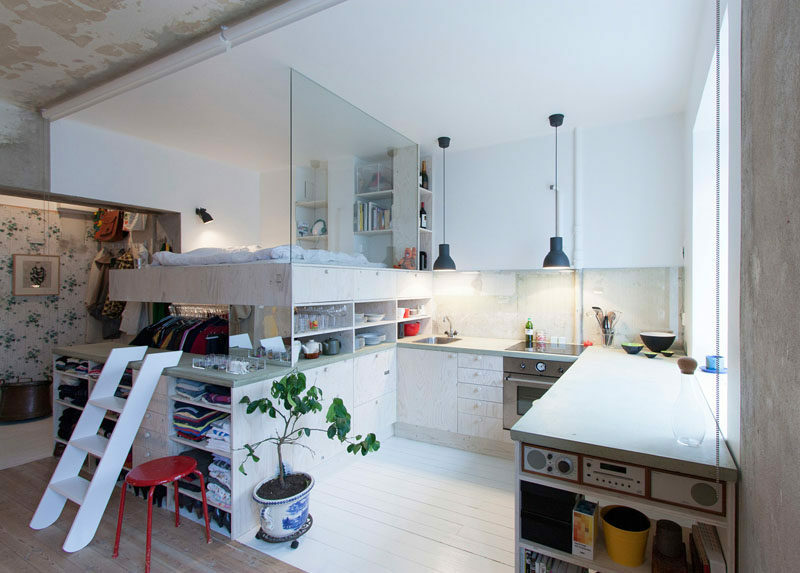 This 387 square foot (36 sqm) apartment was used as a furniture storage room for 30 years, and then in the 1980s it was partially renovated, but due to unforeseen circumstances the apartment was left untouched since then. Architect Karin Matz found the space with wallpaper half removed, only a few tiles, and a kitchen faucet sticking out of a wall, plus there was no electricity and a bathroom with only signs of rats as inhabitants. Karin designed the apartment to keep some of the original details, but at the same time, made the space habitable and more in line with the daily needs of what people need and want today. 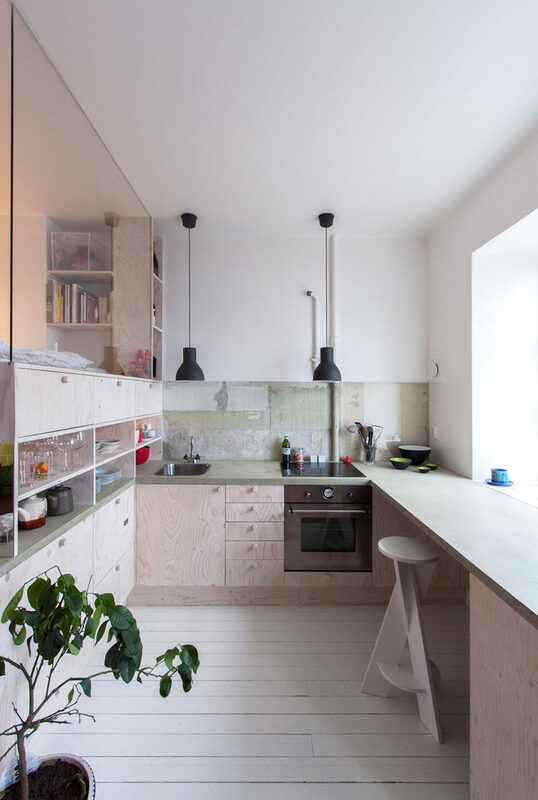 The design of the apartment made use of the light from the windows, and the kitchen and bedroom are all one unit based on the design of Ikea kitchen units. The kitchen shelves seamlessly become the bedroom with only a glass partition separating the two. 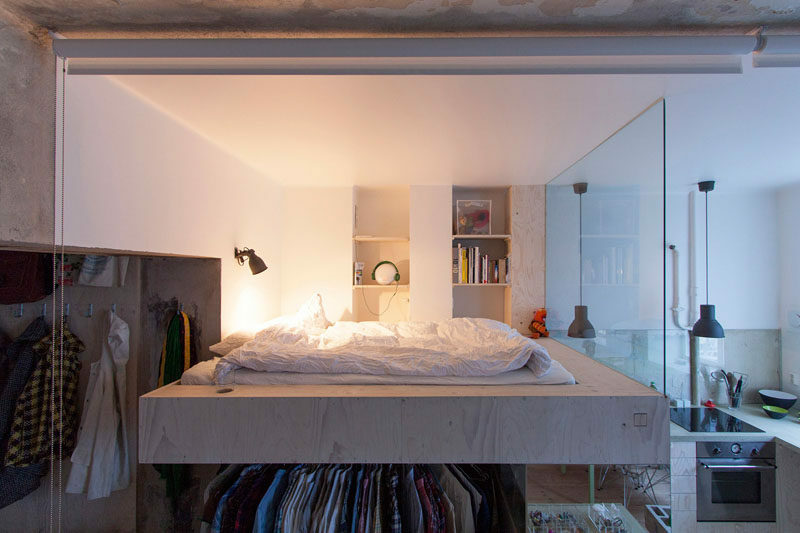 The bed has been raised to provide space for storage underneath, and a single light makes it possible to read in bed. There’s also a couple of blinds installed for closing off the bedroom and kitchen when needed. Hidden under the bed is a carousel clothing rack, making it easy to access the clothes. On the opposite side of the apartment, the space has been left in its somewhat original state. The holes in the the walls have been filled in, loose wallpaper and paint taken down and electrical cables and outlets have been added running on the outside of the walls.